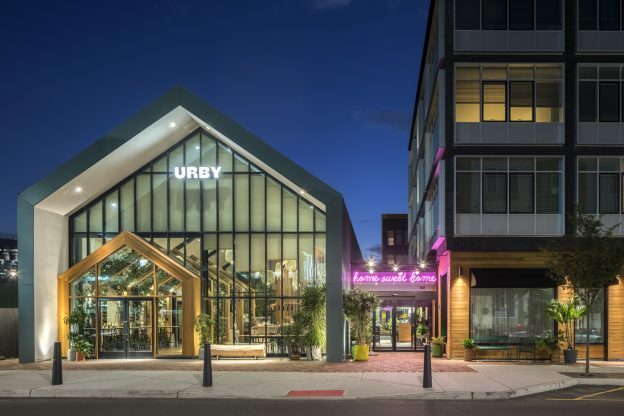 URBY Harrison is the 4th building to be completed with Ironstate in this rapidly growing Town of Harrison, an important stop along the NJ Transit rail line serving major metropolitan areas like Newark and New York City. This LEED Certified building continues a trend of providing luxury apartments to young professionals and a trend towards smaller, more efficiently designed units with access to great amenities and outdoor spaces. The concept is “URBY” focusing on “creating people-shaped spaces for a new generation of apartment seekers”. Ground breaking for the 410 dwelling units happened in 1st quarter of 2016. An aggressive schedule calls for the 1st phase of unit turnover in 1 year. The units includes studios, 1Br and 2BR units across 4 stories of construction and more than 300,000 gross square feet. In addition to the dwelling units, the project includes support spaces and a dramatic Café and Fitness Center located in freestanding buildings on the site. The Café is open to the public to encourage a greater connection to the community. The project also takes advantage of regional transportation to lower parking demand as well as incorporating a shared parking solution with an existing parking deck serving both residents and commuters. This entry was posted in Low Rise, Sustainable Design, Transit Oriented on December 6, 2016 by Melissa Thomson.